"A Vietnamese-style rice noodle bowl. The sauce is a bit sweet, but is balanced by lime juice and mint." Preheat grill for high heat. Combine garlic, 1/4 cup mint, cilantro, fish sauce, honey, lime juice and white pepper in food processor or blender. Puree until smooth. Bring a large pot of water to a boil. Cook noodles and cabbage for two minutes, or until done. Meanwhile, coat shrimp with olive oil, and grill over high heat until golden, turning once. Mince the remaining 1/4 cup mint. 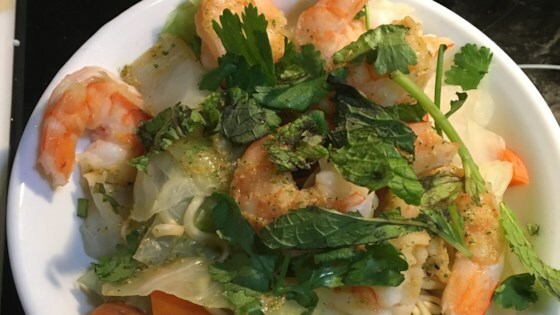 Serve noodles and cabbage in a bowl, topped with sauce and shrimp, and garnished with mint. I think it would have been alot better without the fish sauce. Vegetable broth would make it a nice soup. I am actually Vietnamese and have tried this before. It is very good! I love Thai food and cabbage. So I thought this recipe had great flavors. It was very light. I found it very easy to prepare. I will, however, make some extra sauce. I keep coming back to this recipe...it is so good and really easy to make!